By Kanwal Prakash Singh, INDIANAPOLIS: His Holiness the 14th Dalai Lama of Tibet. He exudes love, kindness, grace and compassion without limit; exhibits moral authority; shares friendliness and invites an amazing response. The Dalai Lama envelopes us in his charming aura. For nearly 2 hours during his Public Talk on June 25th, with more than hour devoted to audience questions and exchange, at the Indiana Farmers Coliseum, part of the sprawling Indiana State Fair Grounds in Indianapolis, the Dalai Lama of Tibet kept his audience of 6,400 spellbound with his enlightened and all-embracing spirit; spiritually-engaging message and vision that to accomplish “Compassion as the Pillar of World Peace” all of us have a responsibility to end violence since man created it and a few in society among the 7 billion human beings indulge in mischief. The Dalai Lama emphasized: a terrorist is a terrorist – whether the terrorist is a Muslim, Buddhist, Christian, Hindu, or Jewish (Jew). For the most part, these faiths get along under the secular Constitution of India. The Dalai Lama reminded the audience that the message of all faiths is love and compassion, harmony and peace, service and our shared humanity. The Dalai Lama saw education and action, not just prayer and hope to transform society, to uplift humanity, to assure justice and human dignity to bring about a change of heart and spirit toward peace and harmony. The Dalai Lama said that science and scientist confirm this and asked that we must analyze our ideas and beliefs to give them practical shape and improve human condition, advance our individual and collective well-being. As always, he was thoughtful and personable; at moments light-hearted; he laughed mostly at his own expense; he was serious as an ancient teacher; disciplined in his own routine. The Dalai Lama saw himself not special, but as one of the 7 billion human beings that inhabit this earth that we share as a human family. I thought this time and all the previous times as I listened to his illuminating words, witnessed his radiating persona and scholarship of Buddhist scripture, respect and knowledge of other world religions, I felt that I was in the presence of not just one of the most admired men of our times, but a messenger carrying a living light of all the ancient wisdom sent by a Higher Spirit, not just for the Tibetan Buddhists, but for all faiths, cultures, and communities. The Dalai Lama spoke of India being the birthplace of Buddhism, Jainism, Hinduism, and Sikhism, and home to followers of Islam, Christianity, Baha’i, 100,000 Parsis (Zoroastrian faith) and others. He mentioned Guru Nanak, the Founder of the Sikh faith travelling to Mecca. The Dalai Lama saw a transcendent message reverberating in all scriptures and diverse religious traditions. The Dalai Lama asked us to work through our differences and make a difference to life, liberty, freedom, and dignity of our brothers and sisters in faith; to end the culture of violence, human suffering, hunger, and violations of human rights in all nations. We should safeguard the environment, protect human health; dispel fear, unproductive divisiveness, and work for mutual harmony. We are in this together as One God’s Children. Education, compassion, and kindness are our sacred anchors to build trust. All else will fall in place. I saw, as millions across the world have seen, god-light in the Dalai Lama’s message and testimony. 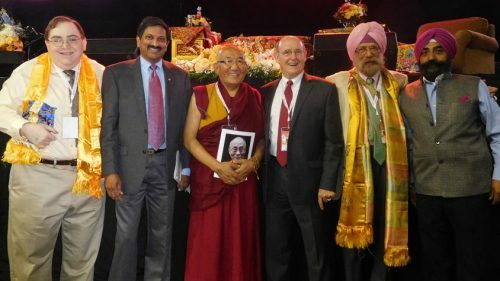 I have followed the events since the Dalai Lama’s flight from his beloved Tibet in 1959 and living in exile in India and emerging as the noble conscience of humanity. Today he is honored around the world, not just a great humanitarian, but as an interfaith global spiritual rattna (a rare and precious jewel). Thank you Your Holiness, for giving millions the much-needed inspiration, in these difficult times, to serve others for the good of us all. You make it real; you embody and manifest what you teach. We pray for your long life and continued guidance to humanity as man struggles to find his way through the maze of challenges, fog of uncertainty, and pockets of heart-breaking deprivation amidst incredible abundance and promising future. You have called us to embrace our better angels, serve and honor God and His Creation. The Dalai Lama’s transcendent message in his eloquent and spirited remarks in “Compassion as the Pillar of World Peace” and his personal stature and deep conviction took us on a pilgrimage of conscience and personal responsibility to translate the lessons of our faith to make this world a more just and hopeful place for all beings and as our legacy for future generations. “With a boundless mind, one should cherish all life; Radiating friendliness over the entire world- above, below, all around without limit.” (Meta Sutra, Buddhist Scriptures). We find echoes of this unifying spirit and lesson in every sacred text. His Holiness the 14th Dalai Lama of Tibet has visited Indiana seven times since 1989. His late elder brother, Dr. Thubten Norbu, settled in Bloomington, Indiana in 1950’s and taught at Indiana University for a number of years and founded the Tibetan Mongolian Buddhist Cultural Center. The Dalai Lama is regarded as the Buddha of Compassion to his Tibetan followers; a venerable spiritual, humanitarian interfaith leader, and a champion of non-violence, justice, and human dignity for all God’s Children. The Dalai Lama understands and sees human struggle and devastating problems through the lens of peace, our intertwined humanity, and our shared destiny, and guided by a kinder spirit. He prays and advocates that we should make the 21st as a “Century of Compassion.” Towards that end, sponsors of the Dalai Lama’s visit have challenged Indiana Hoosiers to work towards 100,000 Acts of Compassion before the end of the year. Now imagine if the whole world got involved, we could achieve making the 21st as the “Century of Compassion” much sooner. This is no small challenge. Man has struggled from the beginning of Life to wrap his heart and spirit around this profound and challenging, yet liberating and emancipating wisdom. The Sikh and other sacred scriptures remind us, that it is with God’s Grace and blessings of an Enlightened Teacher our transition to a kinder spirit is possible. The Dalai Lama is among the most venerable teachers and interfaith leaders of our times. I have had the honor and blessing of being in his presence during each of his seven Indiana visits including his 2016 visit and the 2013 visit to Louisville. In 2003 and 2007, I participated in Interfaith Prayer Services in honor of the visit of His Holiness. The Dalai Lama’s 2016 visit to Indianapolis was sponsored by the Indiana Buddhist Center (IBC), Center for Interfaith Cooperation (CIC), and Compassionate Indy and made possible by generous friends and many dedicated volunteers. We, Nepalese people respect the Holiness of Dalai Lama to go China as a strong spiritual leader to establish Buddha’s regime in Tibet. Then, all the people in the world support His contribution. We should have to convince the reality of Buddhism to the Communist regime. Dali Lama should have to regard the aspirations of the Tibetan people. If Dalai Lama follows my suggestion to return China, all the followers of Dalai Lama, all over the world, support and will happy. Then, that will be the great achievement for all. So, Dalai Lama should respect the Buddhist Forum which has opened in China. We request- Dalai Lama not to think the Free- Tibet. The Chinese never support-Free-Tibet- the suicidal path. The reality is that some foreigners are trying to destroy Nepal by damaging and ruining the monarchy through the Maoist (anarchists) and the traitors of Nepali congress (so called democracy) & UML(Communist) parties and then infiltrate the same virus to Tibet ( for their personal fulfillment) by increasing the Free Tibet activities to separate Tibet from China. They want to abolish the Hindu & Buddha’s identities. So, please, don’t follow the path of CIA. But, you have exercised in futility joining your hands with CIA. In the visit of Austria- Vienna May 2012, you and your PM Lobsang Sangay stressed the real autonomy for Tibet. You have demanded the region aspired to real autonomy with the Chinese constitution.’ Do you think the Chinese Govt. will ready to except your demand? It is uncertain. So, your policy should be used tactfully for the goodness of Tibetans and Buddhism. There are so many stripes in his life that may be questionable, in, 3-Dec. 2011, Dalai Lama, the spiritual leader said in India’s medias the owed his existence to the country in which he had sought exile in 1959- ‘All particles in my mind contain thoughts from Nalanda. And it is Indian Dal and Chapati that has built this body. I am mentally and physically a son of India,’ Just may 2012, one news had published-‘The Dalai Lama recently revealed his fear that Chinese agents have trained female devotees to kill him with poison while seeking blessings.’ (Global Post-‘ Dalai assassination claims mind-boggling.’) Global Post writes- ‘Let the Dalai live his life. His existence is not a crisis for China. he is problem, but one that China can well afford to ignore.’ In this context, I also request him-not to expose such suspicious news because China does not take such risky notorious action. Nepal is the pious country in the lapse of the Himalayas, which is beautiful, quiet, the birth place of Buddha and origin of Hinduism. Besides being the country of Everest it is equally popular with its diverse cultural values. This is the land where civilization began and is also known as the country of ‘SANGRILA.’ Nepal is as holy place to Hindus & Buddhists, as Mecca for Muslims and Jerusalem to Jews and Christians. We know, there is only the interest of America to destroy China carrying Dalai Lama on their shoulder. Nepalese people also always regard the strong unity of China including Tibet. The Lord Pashupathinath, Shoyambhunath of Nepal is the symbols of Hindus & Buddha’s. Nepal is a Birth Land of Buddha. Lumbini is a pious land for Hindus & Buddhists. But, the position is very danger from the Nepalese traitors who are in regime. They are going to destroy the unity between Hindu & Buddha’s. We, all the Nepalese people hate such notorious activities of the foreigners. So, to save the identities of Buddha’s philosophy and traditions, Dalai Lama is necessary to live in Tibet, permanently. So, we Nepalese people request– Dalai Lama should return- ‘Tibet’. Nepal is a country sandwiched between China and India. Because of its geo-political situation, Nepal’s sovereignty has always been very sensitive. Nepal is rich culturally and naturally. Our successful foreign policy would be to maintain our culture, traditions and indigenous identities to balance between China and India with monarchy. So, there must be reinstated the Monarchy in Nepal. Actually, Nepal is a paradise which provides calmness and rejuvenation to the mind. This lovely place is also said as the potpourri of ethnicity and has many cultural landscapes. So, I request Dalai Lama to be the Hero of Buddha religion in this Zone. Then, Dalai Lama will free for coming & going in Lumbani (the birth place of Buddha), Nepal.